The OS wars? They are a mess. Windows is dead? Apple is a phenomenon. Linux is still fighting off its anti-user attitude problems. I finally got the WordPress software (that I use to publish this website) installed on my local computer. It’s in a nice sandbox, so I can turn it on whenever I want. The issues I ran into were mostly permission-based errors, so I’m going to be learning more about setting and managing permissions. Full write-up will come later. The good news is, I can now test changes without subjecting you, my imaginary readers ;), to being the guinea-pigs! It’s worth noting that command-line-use really makes things easy – if you already know what you’re doing! If you don’t , welll….. So I found what looked like some good instructions for setting up a WordPress (WP) sandbox on your local Ubuntu machine. Unfortunately, the instructions I found are only good if you DON’T SCREW ANYTHING UP AT ALL. I would provide helpful tips on how to recover here, but I haven’t quite figured it out yet myself. What seems to be the key, though, is to get MySQL set up properly, then don’t mess with it and DEFINITELY don’t delete it and try to start over without fully cleaning up. More to come once I figure out how to recover…. The ever-useful Ubuntu blog led me to a top-10 list on Ubuntu apps, posted on the also always-useful Lifehacker site. There was also a link from the Ubuntu blog to a write-up on the Washington Post. There are some different views on software philosophy presented in the articles. I often see GNU/Linux users expressing this philosophy of “the CLI (Command Line Interface) method is better because …”, the truth is not so simple. I guess it depends on where you want GNU/Linux to go, though. I’m coming from the Windows world, yet fairly familiar with command-line, since I use it regularly at work. So in one sense I appreciate the power and speed of just typing in what I need done so that I can move on. I also love that if someone knows how to fix your problem, or wants to share an app, they can just say “type ‘blah blah blah’ and tell me what you see”. It’s much more definitive, powerful, and effective, not to mention faster, than trying to talk through a GUI (Graphical User Interface, which is what you stare at every day on the computer screen). At the same time, perhaps 80% of the commands are worthless to me long-term. I do too many varied tasks with the computer, and I want to enjoy and be effective in certain of those things. The best way to enable that? Eliminate the memory issue, by providing a GUI. GNU/Linux – if you’re involved in Linux, you ought to read the attached link. I’ve seen the term GNU many times, knew what it stood for (GNU’s Not Linux), had some vague idea what it was…. I didn’t realize that what we mistakenly call Linux is really just the kernel, just one part of the whole GNU/Linux package. One thing I haven’t done is verified the facts in the linked article, so let me know if it’s actually wrong. Seems hard to imagine someone fighting that battle without the facts behind them, though. http://www.ubuntuforums.org/archive/index.php/t-14062.html This is a forum where airtonix has a post (near the bottom) on getting WordPress up and running on Ubuntu. I’m still struggling with this, but realized I went about it the wrong way. There’s an option when you first install Ubuntu to install a “LAMP” stack. Choose this if you want to use your installation as a server for WP publishing, even privately. http://torrez.us/myubuntu/ Someone writes on going “cold turkey” Ubuntu. Interesting, if a bit scary at first, with a ton of CLI (command line interface) stuff. My recommendations: 1. Don’t read this unless you’re a big geek. 2. Just install Ubuntu, and do things the nice easy graphical way. When you run into a problem, then worry about solving it. It’s much easier to take things one challenge at a time, and every issue you face is solvable one way or another. http://www.ubuntuforums.org/showthread.php?t=186792 Similar to above, but a little more friendly. This is an Ubuntu “customization guide”, and the idea is to make sure you can use all the proprietary stuff that you also used on Windows or Mac, probably without realizing it. Stuff like Adobe reader, Flash, mp3s, all those are licensed and somebody has to pay for you to use a copy. Luckily there are easy ways to get this set up on Ubuntu. Again, my recommendations: Try easyUbuntu and automatix first. Here’s a screenshot from one of the games I tried when I first installed Ubuntu. The first thing you have to do is try the games, right? 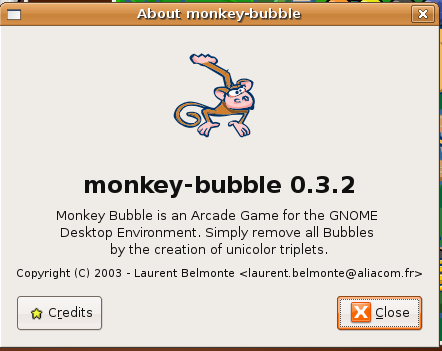 “Simply remove all Bubbles by the creation of unicolor triplets.” (Snicker) That’s why I love geeks. My wife told me recently that my whole blog since I switched to Ubuntu sounds like that….I took the feedback to heart, though I’ll probably need continual reminding (I love you Honey!). I haven’t posted much this week, but a lot’s happened in the background. Here’s a quick summary, and you can expect me to return to a more normal posting schedule. The Ubuntu box is back up – I ran a memory test, then rebooted a few times and it started up fine. During the memory test I discovered my RAM is bad, so that’s probably the reason for all the startup issues with that computer. I also had a little trouble getting Remote Desktop working again, until I remembered to check my configuration for Firestarter (the firewall). Sure enough, I had momentarily lost power, so my laptop had a new IP address. I learned how to allow access to a whole range of IP’s through firestarter’s help site (though it was a little hard to understand). Here’s the short version: IP address/netmask. So if you want everything on 192.168.0.x to have access, add 192.168.0.1/255.255.255.0 to Firestarter’s “allow” list. The frequent (brief) losses of power here probably don’t help any of my computers, so time to look into a UPS. Any recommendations for home use? If you’re curious about string theory, or what in the world 10 dimensions mean, here’s a really nice graphical demonstration to confuse you explain everything. That’s it, folks. More to follow soon. uh oh. I came back from a trip to D.C. and Pittsburgh to discover my old PC, the one with Ubuntu installed, wasn’t on. When I tried to turn it on, it gives me a boot manager with a choice of 2 kernels, plus recovery mode for each, as well as my Win XP installation. The first time, I wasn’t even paying attention, until I saw a blue Kubuntu boot up screen. It’s supposed to boot into regular Ubuntu, though I had switched sessions temporarily to a KDE session. Anyways, trying any of the 4 kernel options results in weird display followed by restarting. I guess I really am going to have to fix what’s wrong with this pc. Only I have no idea what that is, at the moment. Mark Shuttleworth, benevolent sponsor and launcher of Ubuntu, posted an email discussing what went wrong with communication / setting of expectations for what the latest Ubuntu release would deliver. He also points out the very good “problem” of Ubuntu being compared to Windows. Anyways, back to my topic. Oh, yeah, Ubuntu and Dapper Drake. Well, I think Mark’s right about “polished” not being a good word to use. For example I, as a new user to Ubuntu (and Linux), just assumed that of course there was a graphical installer. It didn’t cross my mind that there wouldn’t be, and I certainly didn’t know it was the first time one had been included! This, by the way, is the reason that the first thing I did on Ubuntu was check out the games, looking for Spider in particular. That’s because that’s what my mother-in-law does on the computer – plays Spider. If she can do that as well or better on Ubuntu, fine. If not, go away. One last comment, since I brought up Apple and inflated expectations earlier. I was quite pleased with WWDC, and I suspect anyone who was displeased wasn’t really grounded in this universe before the keynote. The indications were all over the place from most respectable bloggers on what to expect (linked post is from after the keynote, but reflects my thoughts). I’m happy, because it sounds like Apple will again deliver things I actually need (eeeaasy backup) and want (spaces). They seem to be pretty good at doing that. I’m away from home currently, so haven’t been able to play with Remote Desktop into Ubuntu. i’m going to list out things I’ve done so far, and what I still want to setup, for reference later. 1. Changed the IP address from Dynamic (DHCP) to static (typed in a specific address, i.e. 192.168.1.200). This actually was extremely easy, and I didn’t have to restart anything. I have a linksys router, and when I changed the ip address it went live. 1. I set up VNC by installing VNC4Server using Synaptics. This was probably unnecessary, though I haven’t fully verified that. 2. I used this (with TightVNC viewer on the Win XP laptop) to view an Ubuntu X-session across my home network, but it wasn’t what I was looking for. It gave me a grey window with a terminal section. I was able to launch a few games, but of course performance was terrible. 3. I found “Remote Desktop” already available under Ubuntu’s [System | Preference] menu. There’s only a few options, and they’re not hard to get right. Make sure to require a password, but you probably don’t want to require acceptance at the computer you are setting up for remote use – unless this is to help a friend or family member without having to go over to their computer :). 4. Run TightVNC again, but this time remember that you need to give the ip address AND display (i.e. 192.168.1.200:0 is default). 1. Get Remote Desktop (Sharing?) working on KDE – or verify that it won’t work? 2. Figure out sessions, how to change session numbers (why does my alternate KDE session start at 20? How can I make it easier to choose whether to log in to Gnome or KDE?). 3. Try to get Remote Desktop working not just on intranet, but when I’m not at home. Probably a pre-cursor to this is getting a domain name (or two). 4. enough Remote Desktop, move on to “Backing up”. Oh, and I need to write a post on partitions. Any advice, links, et cetera is quite welcome. I will be sure to post what I learn.